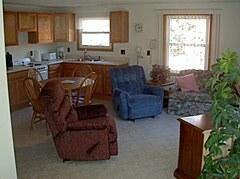 Porcupine Lodge, LLC offers a home away from home with 6 fully furnished condos. Each condo sleeps 1 to 8 people and comes with two spacious bedrooms, one with a king bed, and the other two full-sized beds. Two of the condos are non-smoking. Our living rooms feature a queen-size sofa sleeper and two recliners for relaxing after a day of recreation. Entertainment includes free cable TV and a VCR/DVD player. Your own private telephone line is also available for use. Each condo has fully-equipped kitchen with appliances and a dining area. We also have a large lot for parking your vehicle and trailer, snowmobiles and ATVs. The Lodge is just off the beautifully groomed Trail 1, which makes our place a convenient place for snowmobilers to stay.